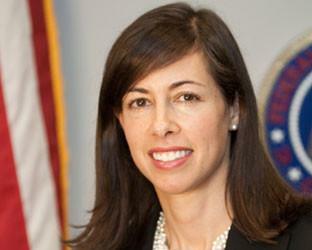 Jessica Rosenworcel, a commissioner with the U.S. Federal Communications Commission, calls for more WiFi spectrum to be made available. Commissioner Jessica Rosenworcel called on the agency to "seize this opportunity" and act on a year-old proposal to make an additional 195MHz of spectrum in the 5GHz band available for Wi-Fi. The FCC now allows wireless devices to operate in 555 megahertz of spectrum in the 5GHz band, but the agency has set limits on how some of that spectrum can be used. With some analysts estimating that 50 percent to 70 percent of mobile phone traffic is now offloaded onto Wi-Fi networks, the longtime Wi-Fi band at 2.4GHz is "getting mighty crowded," Rosenworcel said during a speech before WifiForward, a new group set up to push for more unlicensed Wi-Fi spectrum. Members of the group include Google, Microsoft, Best Buy and Comcast. "Let's start by leaving behind the tired notion that we face a choice between licensed and unlicensed airwaves, because good spectrum policy requires both," she said. "Moreover, I think this kind of division is a simplistic relic from the past. " Some mobile carriers and congressional Republicans have questioned whether the FCC should carve out unlicensed spectrum in lower bands coveted by the carriers, but carriers don't see a licensed use for the 5GHz band. Satellite firm Globalstar uses part of the 5GHz band, however, and has raised interference concerns about new Wi-Fi services there. Cisco Systems predicts that by 2017, a majority of the Internet's traffic will be carried on Wi-Fi. About 90 percent of the tablets now sold in the U.S. have Wi-Fi-only connections, added Raul Katz, director of business strategy research at the Columbia Institute for Tele-Information. Counting several factors, including the cost for mobile infrastructure that would be needed without Wi-Fi, the annual value of Wi-Fi to the U.S. economy is about US$220 billion, Katz said at the WifiForward event. In addition, part of the 5GHz band is targeted for use by smart automobile technologies, and the Intelligent Transportation Society of America and other auto groups have also backed opening that part of the band to Wi-Fi. The FCC may act on part of the 5GHz band as soon as its March 31 meeting. Parts of the 5GHz band present a "terrific near-term opportunity" to add Wi-Fi spectrum, Rosenworcel said. "We should move beyond old dichotomies that pit licensed versus unlicensed spectrum," she said. "Because across the board we need to choose efficiency over inefficiency and speed over congestion. Because we can take steps that inspire innovation and meet the growing demand for wireless services -- or we will fall behind." Rosenworcel also called on the FCC to consider opening up parts of lower bands to unlicensed Wi-Fi, including parts of the 600MHz band now controlled by U.S. television stations. That spectrum, eyed by carriers as some of the best available for mobile broadband service, is scheduled to be auctioned by the FCC in mid-2015.